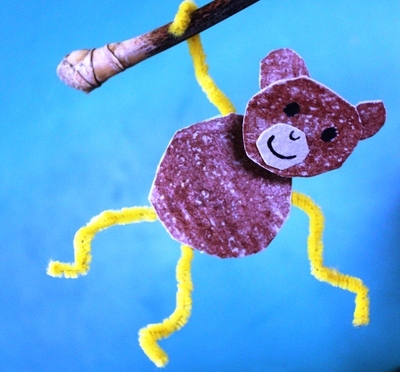 This cheeky monkey is very simple to create and very cute to play with. 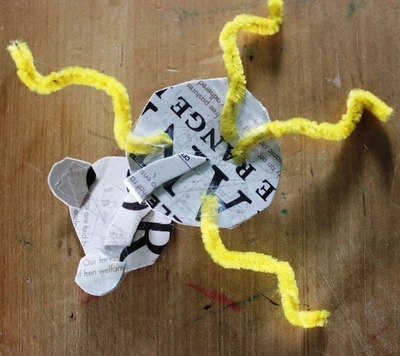 All you need is a few pipe cleaners and some cardboard scraps. We also made an elephant friend for our pipe cleaner monkey, so they can hang around the jungle together. Your monkey should turn out to be quite small and is therefore very handy for carrying in cars or to keep children entertained on public transport. 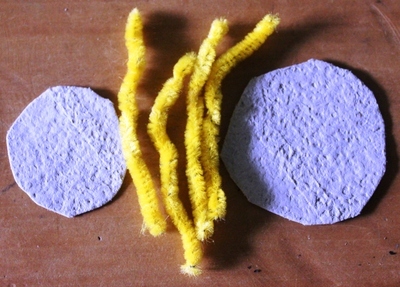 Take a small piece of scrap cardboard and cut out one larger (about ten cms) and one smaller (about five cms) circle. Color (or paint) the circles in brown (or any color you wish). 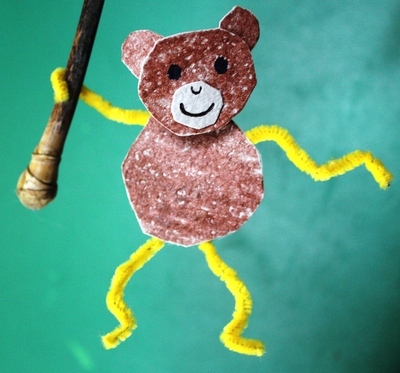 Cut the pipe cleaners in half to create two monkey legs and two monkey arms, then turn the circles over and use some sticky tape to attach the arms and legs. Use some cardboard to attach the head to the body. Draw on the monkey's eyes and mouth with a pen or texta, then stick on some ears. Your little jungle monkey is ready to attach to any bit of tree, handle or hook around the house or garden. Perhaps he needs a friend? 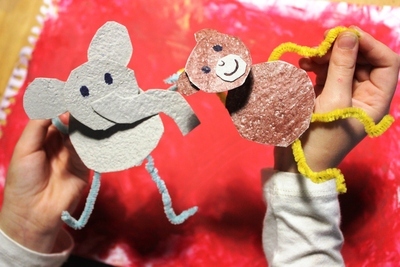 Try making an elephant or an entire monkey family. I just love this little monkey and his elephant friend. My son has jungle themed curtains and it would be lovely to have a couple of funny friends hanging from his bookshelf.